This story was updated at 5:42 p.m. ET. An unmanned military plane billed as the "fastest aircraft ever built" crashed into the Pacific Ocean today (Aug. 11) after a malfunction caused it to stop sending signals while flying at more than 20 times the speed of sound, military officials said. The Falcon hypersonic HTV-2 is an unmanned, rocket-launched, maneuverable aircraft that glides through the Earth’s atmosphere at incredibly fast speeds. The flying prototype, called the Falcon Hypersonic Technology Vehicle 2 (HTV-2), plunged into the ocean after shifting into a mode that allows it to fly Mach 20, or about 13,000 mph, according to the Defense Advanced Research Projects Agency (DARPA), which oversaw the test flight. "More than nine minutes of data was collected before an anomaly caused loss of signal," DARPA officials explained in a statement. "Initial indications are that the aircraft impacted the Pacific Ocean along the planned flight path." The update means that today's Falcon HTV-2 test flight, the second performed by DARPA, lasted longer than the project's first flight in April 2010. That first flight lasted nine minutes and ended when an earlier hypersonic vehicle detected an anomaly and also crashed itself into the ocean. 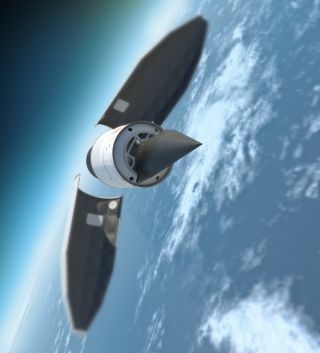 DARPA officials said that according to telemetry from today's HTV-2 flight, the hypersonic vehicle separated from its Minotaur 4 rocket booster as planned, then shifted into the proper configuration for Mach 20 flight — a major feat. What happens next, though, is a mystery. "We do not yet know how to achieve the desired control during the aerodynamic phase of flight," Schulz said. "It's vexing; I'm confident there is a solution. We have to find it." The Falcon HTV-2 aircraft is a wedge-shaped plane equipped with thrusters and aerosurfaces designed to provide control during hypersonic flight. It is built to withstand extreme heating since the flying at Mach 20 can subject it to temperatures of up to 3,500 degrees Fahrenheit, according to DARPA officials, who called it the fastest flying vehicle ever constructed. "To address these obstacles, DARPA has assembled a team of experts that will analyze the flight data collected during today's test flight, expanding our technical understanding of this incredibly harsh flight regime," Schulz said. "As today's flight indicates, high-Mach flight in the atmosphere is virtually uncharted territory." To reach hypersonic speeds, the HTV-2 launched into suborbital space atop a Minotaur rocket. The vehicle then popped free of the booster and re-entered Earth's atmosphere. During today's test flight, DARPA scientists expected the HTV-2 aircraft to use small rocket thrusters to control its re-entry, then pitch itself up to increase altitude and control. After that, the vehicle was expected to enter a long glide phase in order to perform a set of preprogrammed maneuvering tests while flying at about 13,000 mph. Once those tests were complete, the vehicle was expected to crash itself into the ocean to end the mission. But during the actual flight, ground stations lost contact with the HTV-2 vehicle earlier than planned. An engineering review board to analyze that data in order to help shape future global strike programs, DARPA officials said.